"American Idiot" is playing at D.C.'s National Theatre. 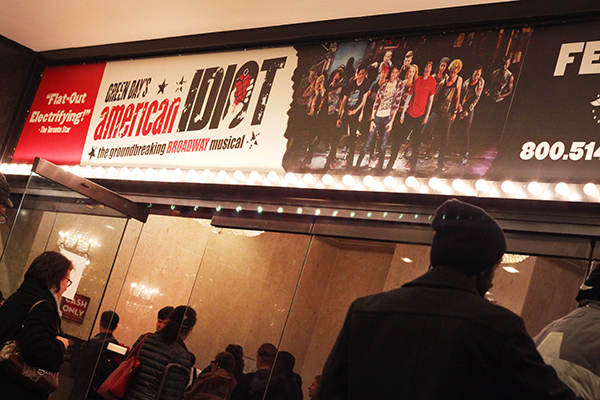 Seeing “American Idiot” on stage is like the Green Day concert your parents never let you go to in middle school. For an album encompassing lead singer Billy Joe Armstrong’s 2004 angst against a president and government he detested, you’d think the play would be dated. Instead, “American Idiot” acts as a flashback to those excessive and exaggerated apathetic moments of a suburban youth in revolt. Watching the outbursts of anger holds a mirror back to those days where your only answer to “How was your day at school today, sweetie?” was to run upstairs, slam the door and blast, well, Green Day of course. The lead, Johnny, sums this up perfectly: He’s dismissed his suburban hell and run off with friends Will and Tunny to find an authentic life in the big city. How’d he pay for his bus ticket, though? He tells us he robbed a grocery store. Actually, he just stole it from his mother’s dresser. Then, he pauses and admits she lent it to him. Watching these three leads fist-pump, head-bang and scream about all their supportive, suppressive households reminds you of back when your idea of a rough life was your parents not understanding why you need to wear racoonish amounts of eyeliner to school. But the characters do face harsher realities: Johnny gets into heroin, Will’s girlfriend gets pregnant and Tunny goes off to war. You’re not really there to watch the plot – “American Idiot” is the best Green Day cover band you’ll ever see, and luckily contains mostly songs from the titular album, so you’ll still remember all the words. Plus, after curtain call, the company comes out for an encore of “Good Riddance (Time of Your Life),” all on acoustic. The play will run until Feb. 23 at the National Theatre. If $45 is a little too much to spend on a night of nostalgia, a lottery will be held two hours in advance of each performance for a select number of $25 seats.